Well we just got back from a wonderful vacation and sewing retreat on Monterey Bay at the accommodations at Asilomar Conference Grounds in Pacific Grove, CA. We had another great time sewing and just being together with Jane's fabulous group of women. Some ladies brought garments that were already underway and now needed Jane's instruction, and some brought fabric to have Jane help them get started. But everyone left with a sense of accomplishment, and we all got to see some very interesting garments being constructed. . There were many highlights during this sewing vacation. 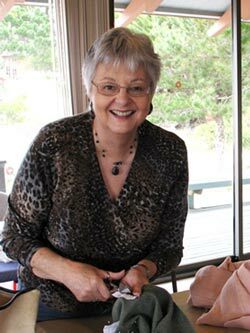 Perhaps the most fun was just being together in the environment Jane creates, and talking and laughing with our fellow sewing enthusiasts. One night we gathered around a grand piano to sing along with Zelda as she played old songs from the 60's. A visitor at Asilomar joined in to sing in Spanish, and it was an enjoyable ending to a day of sewing. We also had fun shopping of course. We went to Back Porch and enjoyed their gallery of appliqueed wall hangings by Wilda Northrup, and some of us found just the perfect buttons for our garments at Findings in Carmel or the yarn shop in Pacific Grove. And of course a trip to Carmel is not complete without at stop at Pacific Rim to view all their unusual styled clothing. We encouraged Jasna to purchase a black top and unusual pants. We all were excited with the jacket Susie was making using the new Koos coat pattern. The pieces are cut with a lot of bias in places, and this presented some challenges. But thankfully we had Jane, and she and Susie worked it out. Susie's coat will be reversible with dark blue cashmere on one side and several different pieces of blue and purple on the other side. Although the sleeves were not set in yet, we all tried it on and loved how it looked on both Susie and Vicki G who who are both tall. There might be a few ladies looking to Jane to help them with a Koos coat too, and she has some ideas to help in the fitting and construction. And of course spring is the time to create tee shirts. So there were quite a few tee shirts being made using a variety of patterns including the Christine Jonson V neck tee shirt. Jasna used this pattern for one of her tee shirts she made for her mom. Zelda had some beautiful purple heather fabric for a tee shirt from Emma One Sock, and she used a pattern with a flare design at the hip. It really was becoming on her. Other ladies worked on some great garments too. Barbara started her third couture jacket, and had all the major seams sewn up by the time we left. It was amazing how fast she was constructing this couture jacket. Carrie started and finished a jacket, and Ellen worked on a beautiful silk charmeuse blouse. 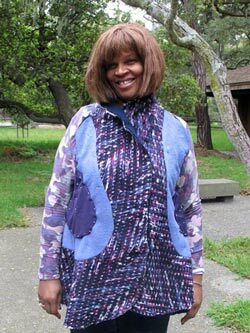 Vicki E created a "couture" fleece jacket using a Marcy Tilton pattern. She added flowers she created from cut shapes of fleece rather than the strips of trim as shown on the pattern. Sharon worked on a pieced jacket that Jane designed for her, and they completed all the design decisions on fabric choices and placement. 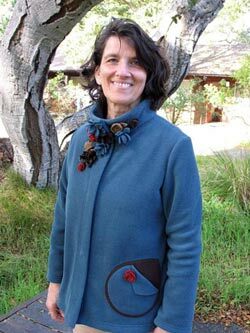 Thea finished an embellished sweatshirt she had started on a previous Asilomar Sewing Retreat. And there were a few quilts that made brief appearances. It was fun to see the variety of projects. While the weather was a bit overcast most days, we still enjoyed going to the beach. On one of the walks a group of the ladies stopped to watch the otters with their babies floating in a cove in the ocean. We all thank Jane for another wonderful sewing vacation and time to get together with a fabulous group of women. Jane is an extraordinary teacher and clothing designer and we all appreciate her so much. We look forward to the next retreat. Thank you Jane!!! !